While ceiling lights are fitted into the ceiling or on the ceiling, pendant luminaire and hanging lamps are used to illuminate a particular area, for example, to illuminate the dining table well. Its usage is, however, more varied and covers not only the use in the home, but also it is used in companies, for example, offices, workshops and production halls. Hanging lights and pendant luminaire are mostly fixed to threaded rods or steel cables and hung from the ceiling. 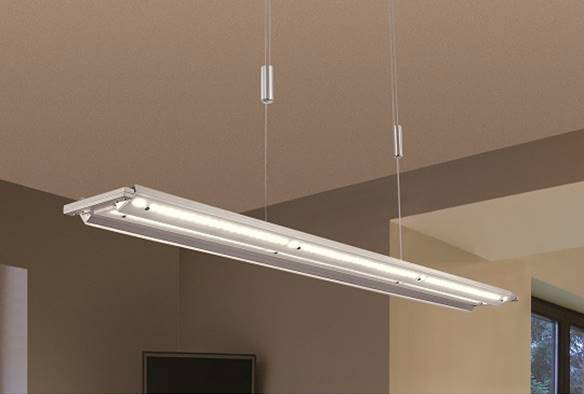 Their glare-free lighting enables risk-free work by an optimal and comfortable luminosity. We provides an excellent offer in terms of hanging lights and pendant luminaire, which will illuminate your rooms stylishly and perfectly. Hanging lights and pendant luminaire are not only extremely practical, but also, without a doubt, an optical eye catcher due its distinctive appearance in a room. Hanging lights are positioned, for example, in the dining room above the dining table, to provide the ideal illumination while eating and enjoying. The hanging light, in the dining room, is mostly hung with a distance of 60 cm above the dining room table, meaning there is no glare effect at all. The use of hanging lights and pendant luminaire is, however, by no means only limited to the eating area. They can also be used in other rooms, for example, for the corner of the couch in the living room or pendant luminaire with playful motifs for a child’s room. Thanks to our large product palette, you can let your creativity run free. Pendant luminaire and hanging lights serve as indirect lighting in the entire lighting concept and illuminate certain areas directly. Thereby, the pendulum length for most of the models, is readily adjustable, which means that the distance between the ceiling and the illuminated surface can be adjusted according to the circumstances. Hanging lights and pendant luminaire are also very versatile in design, but also always timeless and suitable for every interior style. Our exclusive choice of models in country house style, classic-elegant versions or modern pendant luminaire and hanging lights, leave no wish unanswered. While classic pendant luminaire with filigree details supplement the fine furnishings in your home, the design models provide interesting lighting effects on ceilings and walls.